The Art Lab is where we encourage visual arts as a platform for all areas of the curriculum. Our Art Curriculum is as much about object manipulation, developing correct pencil grips, mark making, and colouring and drawing as it is about Classical Greek Art, French and German Romantic Art, the Renaissance, The Munich School, Palladian Architecture, the Lascaux Caves, Rodin, Michaelangelo, Mondrian, Calder, Damian Hirst, Andy Warhol and Roy Lichtenstein. 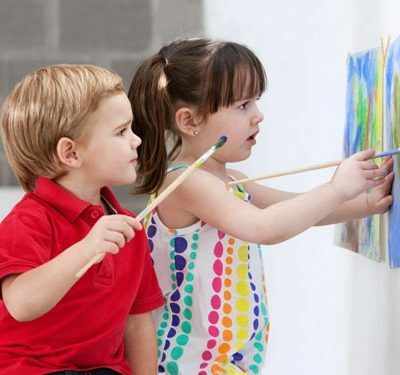 We use the visual arts to engage children in kinaesthetic, visual, spatial, logical and emotional activities. At the Wandsworth Preschool the works of Mondrian are used to explore geometry and mathematical shapes. We use Fiippo Lippi to explore perspective and spatial placement. The works of Picasso and Durer help us to look at our emotions and feelings, and how we see ourselves in a mirror, how is a face arranged, and what happens if you put your nose on the side of your face? We always have an exhibition of art by the children every year at our Wandsworth Day Nursery. We sell the works to parents and donate the proceeds to a children’s charity.